When you are a web designer it can be hard to break away from your client's websites to give your own Google Sites a graphical update. 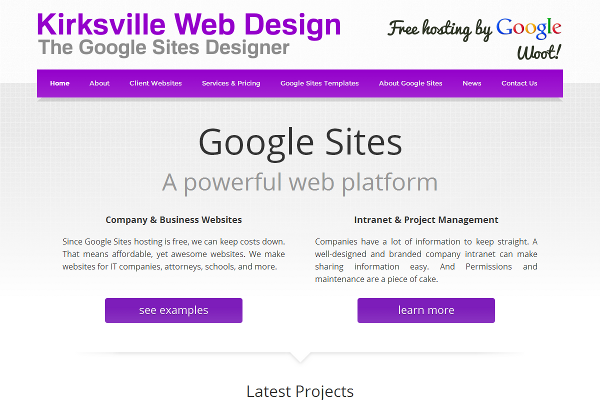 Kirksville Web Design had not been given a proper revamp in a couple months. Using GIMP, we created new header and footer images. We simplified the approach on the homepage and made a more dramatic impression. I know my style, skills, and preferences are always changing. So it's not say the old design was bad, but my designer conscience started to bother me and I started not to like it as much as I once did. One thing I am fond of is the Google logo and script in the top right. The color and familiarity of the logo grab your attention. 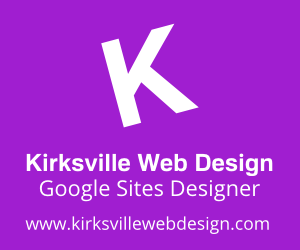 The Kirksvile web design google tool is given in the post here. these are good..the details are good..it gives us good idea about things..thanks for this. I always habituated to read all your new blog and You always provide new techniques and idea to us. Wow! Thanks again for providing us a wonderful blog! good job! Great !! I visited your blog and useful details for user interface designing . Thank you. This post is so informative, thanks to share this article.